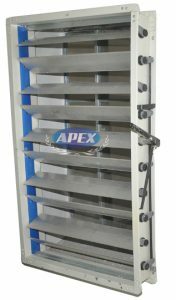 Air dampers are provided at fresh air entry, hot air exit, and re-circulation and by pass locations. They are used for controlling the air flow in the required proportion. 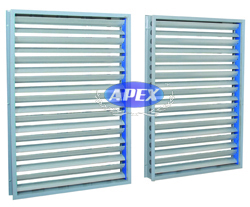 Aluminium extruded / galvanized aerofoil louvers are housed in heavy duty galvanized iron boxing powder coated with outer fixing frames made of mild steel. These dampers are used for automatic purpose.